New Zealand made 131-4, batting first after winning the toss in a match reduced to 23 overs per side. The West Indies slumped to 9-5 flirting with the lowest-ever score in an ODI before finishing 99-9 as they chased a target adjusted to 166 runs under the Duckworth-Lewis system, according to the Hindu.com in its December 27, 2017 publication. Santner took 3-15 from five overs and Boult had 3-18 as the West Indies run chase crumbled. West Indies captain Jason O. Holder made 34 from 21 balls and put on 48 in a sixth wicket partnership with Rovman Powell (11) to carry the West Indies past Zimbabwe’s record low score of 35, then past the West Indies’ own low mark of 54. Nikita O. Miller then made 20 and Shannon T. Gabriel 12 in an unbroken 26-run partnership for the last wicket. “It was an outstanding performance today,” New Zealand captain Latham said. “It was nice to be able to get back on there after the rain delays. Latham said Ross Taylor’s unbeaten innings of 47 from 54 balls made the critical difference between the teams after New Zealand had slumped to 26-3 early in its innings. New Zealand had reached 83-3 from 19 overs when rain first drenched the match at Hagley Oval. 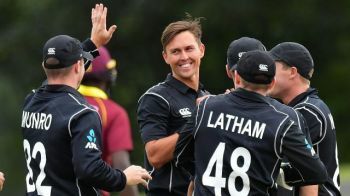 Taylor, 32 not out when the rain began, went on to top score with 47 and Latham made 37 from 42 balls with Taylor in a partnership of 73 for New Zealand’s fourth wicket. Henry Nicholls added 18 not out from nine balls as New Zealand posted a competitive total in difficult circumstances. New Zealand won the first match by five wickets, before claiming the second match by 204 runs. The hosts also swept the test series between the teams 2-0.